These steps here demonstrate the basic steps on how to make loops with wire jewellery. 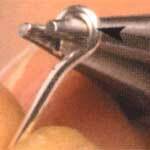 A round nose plier is used here but we do recommend a specialty jewelry wire like Wire Looping Pliers which makes the work immesurably more accurate and enjoyable. The most popular and suitable wire to work with is between 0.6 and 0.8mm (see Wire Gauge Conversion table). 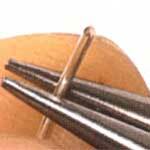 Use copper or silver plated wires while practising as they are inexpensive and easy to use. Also easy on your fingers! Simple wire loops made this way are a perfectly accurate way to secure a few dangle beads on a drop earring. 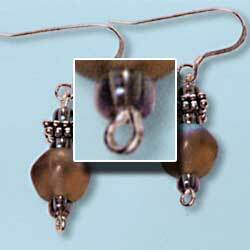 Here we show how to make a pair of beaded dangle for drop earrings using jewelry wire. 1) Cut 2 lengths of wire with the wire cutters. The lengths should be sufficient to thread the beads from you design and with generous extra length for the 2 loops you will form on either side of the threaded beads. Leave at least about 8mm extra length for each simple loop. 2) At one end of the cut wire, use the tip of the round nose pliers, and curl the wire away from you till you form a neat, small loop. If you can't do it in one smooth roll, then reinsert the plier tip into the partially formed loop to close the loop snugly. 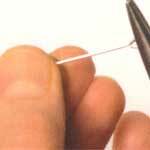 How far in from the tip of the round-nose pliers you use when gripping the wire in preparation for curling the wire will determine how big/small the size of your loop will be. 3) To strengthen and straighten your wire, run you fingers or flat nose pliers (a nylon jaw plier would be better to prevent marring the wire) up and down the wire length a few times. 4) Thread your chosen beads. Make another simple loop to hold the beads in place. 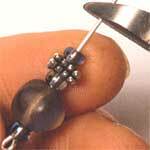 (see steps in Drop Earring Using Pins on how to make the ending loop after your had threaded your beads). 5) Make another set for the other side of your earrings.